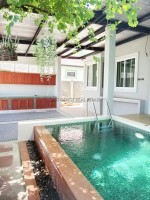 Three bedroom home, with private pool located on the quiet residential village of Siam Executive Estates. The house is surrounded by high wall for privacy, and has a patio area by the pool. A fully equipped European Kitchen, along with full air conditioning, UPVC windows and modern bathrooms. Outside is a Thai kitchen and laundry area. The title deed is registered in company name making transfer easy and inexpensive.